The House Ways and Means Committee, under the direction of chairman Dave Camp (R-Mich.), is circulating a draft of what could become a bill known as the Tax Reform Act of 2014. Under one provision, tax-exempt organizations – including, committee staffers say, nearly all public and private colleges and universities – would be subject to a 25% excise tax on compensation in excess of $1 million paid to any of its five highest-paid employees for any given tax year. It’s not exactly chump change, either. The non-partisan Joint Committee on Taxation estimates the excise-tax provision would increase tax revenues by $4 billion from 2014 through 2023. Do I think it’ll pass? Maybe not. Do I think it will stir the already roiled waters the NCAA is attempting to navigate? You tell me. But the staffers are well aware of its potential impact on colleges and what they pay high-profile college coaches, who are among the nation’s top-paid and best-known public employees. And reflects growing skepticism about big-money college sports programs’ place at institutions that enjoy broad tax protections and whose donors gain tax benefits from their gifts. When you start talking tax code, you start scaring the crap out of university administrators. I hope somebody asks Emmert about tax code incentives at the Final Four presser. Q: Last year the Star position was played primarily by Josh Harvey-Clemons, who was 6-foot-5, 215 pounds. How has a 5-9, 183-pound guy like Green been able to fill the role so well? A: “It was a little bit of a different philosophy. Our Star is a little bit more of DB than linebacker. A third corner is what he is. Last year, it was a little bit different of a philosophy as far as coverages. The things we ask that guy to do, he’s got to do a lot of the inside receiver coverage by himself and that’s a challenge. [Emphasis added.] That guy has got to be versatile because he’s got to be able to blitz and he’s got to be able fit the box against the runs and he’s also got to be able to run and play coverages and everything has to be tied in with everybody else we have on the field as well. So it’s a little different in Coach Pruitt’s system than what they did at least last year. Any DB handling inside receiver coverage has to be an improvement over an ILB. Thanks for giving me hope, Coach. It also sounds like Green will be on the field a good bit: “Sixteen to 18 percent of the time we’re in our base defense that puts a SAM on the field. Our nickel package has a star and our dime package has a “Money” that puts six defensive backs on the field.” That’s less time for Herrera and/or Wilson on the field making tackles. First, Mark Richt lost control of Paris Bostick’s toe. Now he’s lost control of Paris Bostick. #UGA and ILB Paris Bostick have "mutually agreed' he should transfer. UPDATE: It’s always tough when expectations don’t meet reality. 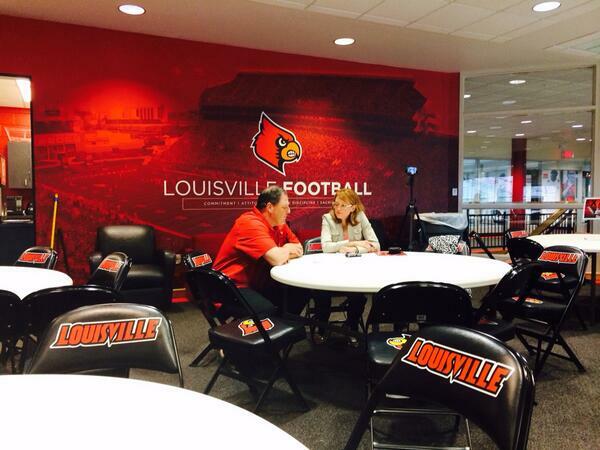 ESPN’s Andrea Adelson sits down to get the real poop from new Louisville defensive coordinator Todd Grantham in what looks like a very large, very empty space. Have at it in the comments, peeps. Emmert will most likely endure probing questions Sunday when he conducts his annual state of the union press conference at the Final Four. But in the current big picture, he admittedly has nothing more than a bully pulpit. It’s the way his term has played out. Emmert’s mandate to reform from the NCAA board of directors went flat. Witness the overreach at Penn State, the screw up in the Miami case and the failed 2011 presidential summit. His organization is now attempting to restructure from within before the courts or Washington intercede. Yeah, that presser’s gonna be awkward. No question that the guys in charge of college athletics have been slow to recognize the need for change. But even taking into account the role inertia – the most powerful force in the universe! – plays in big organizations that have been used to getting their way for decades, there are a couple of structural flaws that make it even more difficult for the NCAA and its member schools to react nimbly to the changing times. One, unlike the pro leagues, college athletics don’t form a monolithic structure. Instead, you have a bunch of conferences that compete with each other commercially, have separate rules and management and have had no reluctance to raid each other for members over the past few seasons. What limited common purpose they share is overseen by an organization that is distrusted to some degree by much of its membership and derives a part of its authority from the control it exercises over a lucrative basketball tournament. Some of what the NCAA has to do, then, is akin to herding cats. Either way, he’s a winner. By the way, the next potential nail in amateurism’s coffin is scheduled for April 25. Be prepared for another round of how America lost. It’s a beautiful day for football. Let’s play two! Mike Ekeler wants more spring, damn it. I'm going to talk to the NCAA and see if we can get 15 more practices. Today is practice #9. It's going fast -better make Em count. … somethin’ be wrong with you. By the way, does it seem like Thompson’s coach is enjoying the visitation process even more than Thompson is?